ThermalStar Smart compressed air dryers perfectly and continuously adapt to actual operating conditions, ensuring perfect dewpoint control together with the lowest operating costs. It is designed not only to minimize the use of compressed air and electricity in it’s operation, but also to significantly reduce the operational costs of the compressor by minimizing pressure loss. Most refrigeration dryers are sized to achieve their design performance at the plant’s most extreme working conditions. Those conditions are rarely seen on an everyday basis. The air compressor load can vary significantly during the day and temperatures can fluctuate from day to day and season to season. So let’s take a look at how the ThermalStar Smart dryer can handle these challenges making it an energy efficient and environmentally sound compressed air dryer. Patented SmartPack 4-in-1 heat exchanger: The SmartPak heat exchanger features an extremely robust, all-in-one aluminum design, with no interconnecting tubing. Optimum dewpoint performance is ensured thanks to wide air channels leading to low air velocities, an oversized slowflow demister separator offering perfect condensate separation even at partial air flows and a dewpoint sensor within the air flow for improved control. The generously sized air-to-air section and Thermal Shield Insulation (TSI) contribute to a very low power consumption..
A truly unique part of SmartPack is the integral zero loss drain. The drainage chamber is integrated into the heat exchanger while the valve mechanism is fitted in an easily accessible drain niche. The Smart Drain continuously adjusts itself to the actual working conditions, ensuring zero air loss and a notable reduction in system power consumption. An innovative control system continuously monitors for fault situations. If a fault does occur, an alarm is signaled and the drain switches to conventional timed solenoid drain operation. The dual mode circuitry ensures maximum reliability. 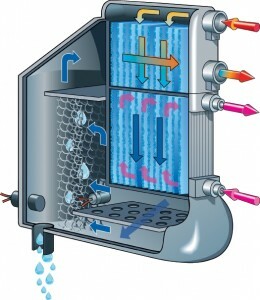 Unlike traditional cycling dryers, the refrigerant to coolant exchanger is mounted inside the Thermal Mass SmartStorage. This not only reduces dryer footprint but also reduces power consumption and improves temperature control. The coolant-to-air exchanger’s compact design, with no other sources of energy loss, improves thermal retention, further minimizing power consumption.The ThermalStar Smart compressed air dryers are designed for Air Quality and Energy Efficiency. Not only will they provide your plant with clean, high quality compressed air, but also with low lifetime costs and reduced CO2 emissions. Let Lewis Systems & Service Co., Inc. help you discover the many benefits of implementing this Smart technology in your plant. Contact us today to speak with someone in more detail.